Shrimp Pesto Pasta on your table in 20 minutes! 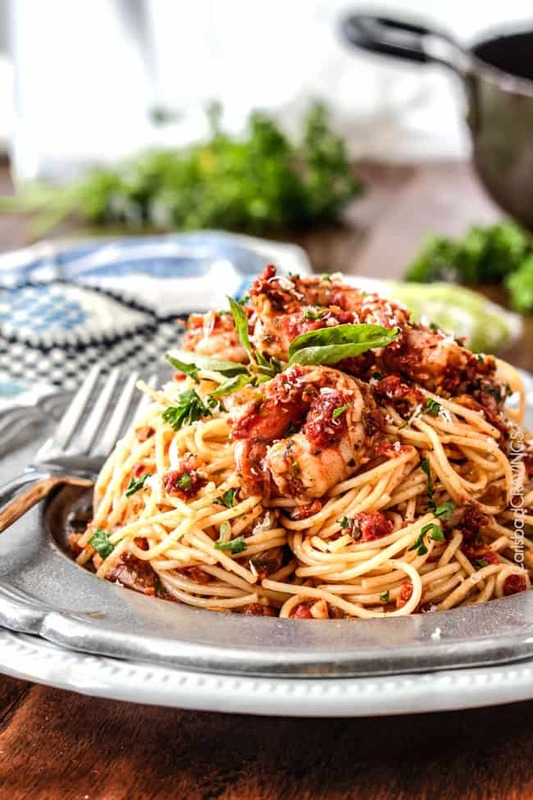 Shrimp Pesto Shrimp Pasta loaded with juicy shrimp and bathed in a sun-dried tomato pesto that is OUT OF THIS WORLD! 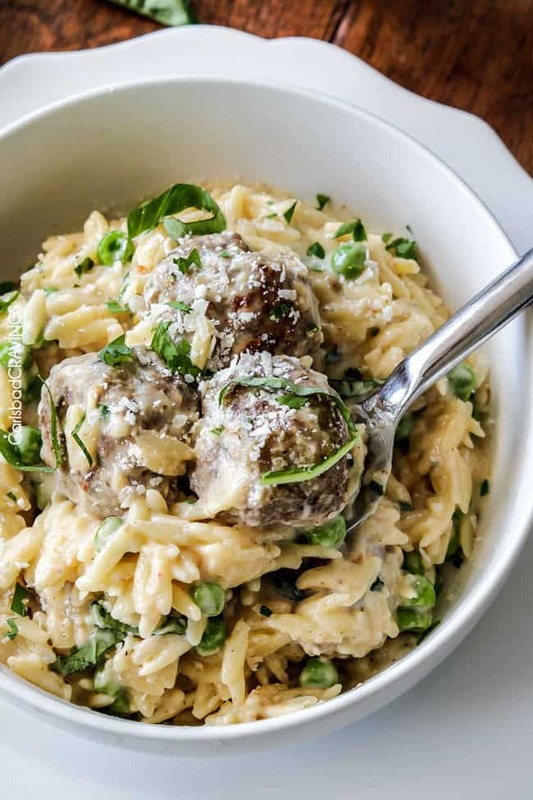 This quick an easy dinner boasts more flavor than a 5 star restaurant at a fraction of the cost! 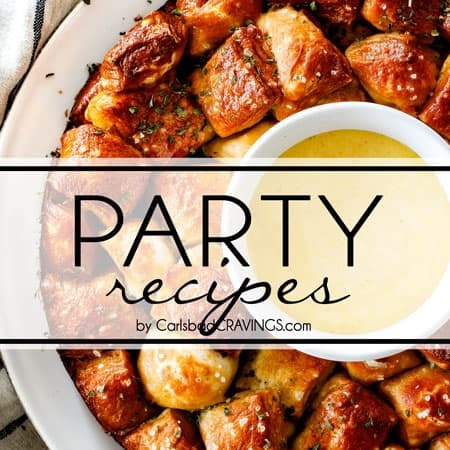 It is guaranteed to become a new favorite that is easy enough for everyday but gourmet enough for special occasions and company. 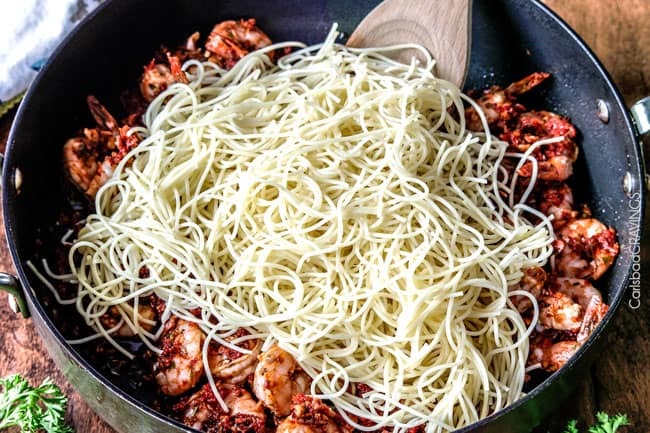 You guys know I love pasta from Creamy Sun-Dried Tomato Pasta, Shrimp Fettuccine, Spaghetti and Meatballs, Weeknight Spaghetti Bolognese, Million Dollar Mac and Cheese and Chicken Parmesan with spaghetti, but I am not exaggerating when I say this Shrimp Pesto Pasta is one of my favorite pastas of ALL time. I kid not. 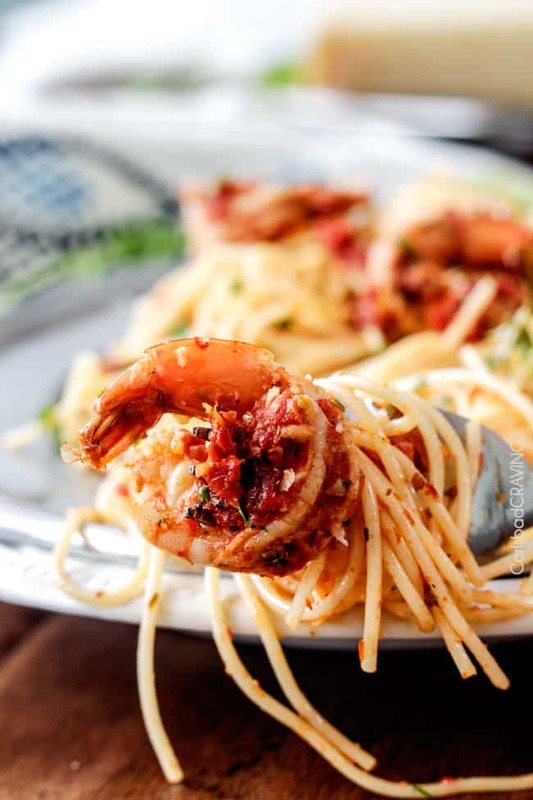 Not when it comes to Sun-Dried Tomato Shrimp Pesto Pasta! 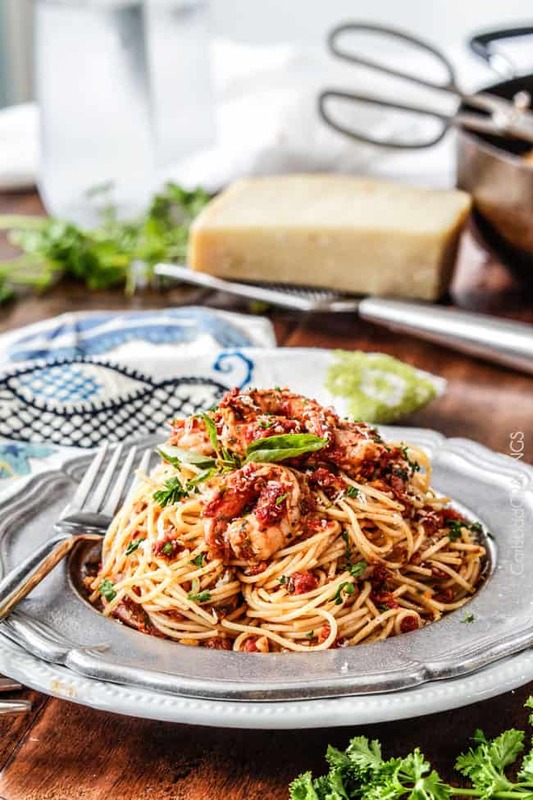 This shrimp pasta is quick and easy – 20 minutes or less – but the flavors are out of this world thanks to the sun-dried tomato basil pesto. This pesto deserves its very own recipe. It’s tangy, garlicky, herby, salty and packs a flavorful punch – you will want to use it on everything! The shrimp gets cooked in the pesto so it soaks up all the magnificent flavor then bathes the succulent shrimp and the pasta. It’s intoxicating. And did I say only 20 minutes already? Do I have to use shrimp? If you don’t have shrimp on hand or you want to make this Shrimp Pesto Pasta more economical, you can easily replace the shrimp with chicken for an equally delicious dish! 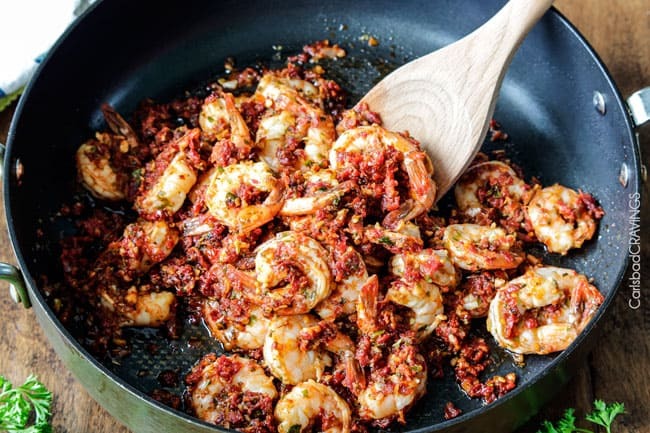 Simply chop the chicken into bite size pieces and cook them just like you would the shrimp. Can I use other noodles? Shrimp Pesto Pasta is delicious with any type of pasta! 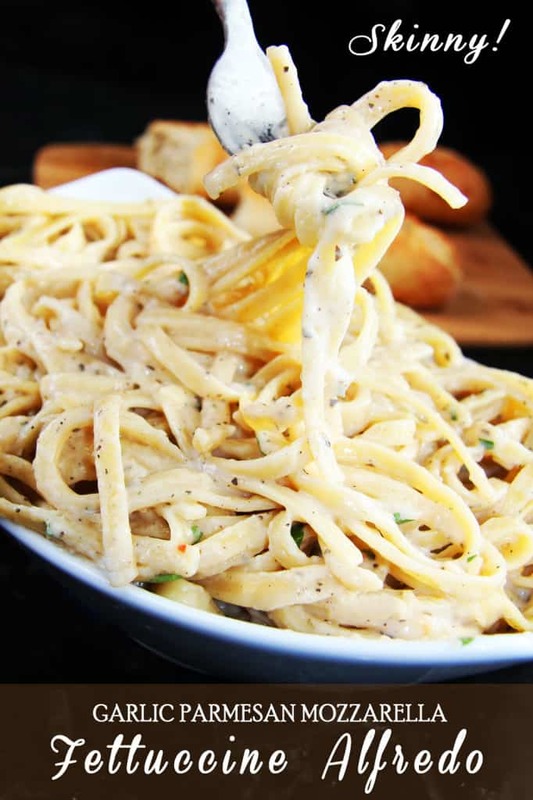 I prefer linguine, but you can use spaghetti, angel hair pasta, rigatoni, penne or fettuccine. Really any pasta will work, just make sure it is cooked al dente! This Shrimp Pesto Pasta could also be turned into a rice dish by stirring into rice or even over spaghetti squash or zoodles for a low carb alternative. 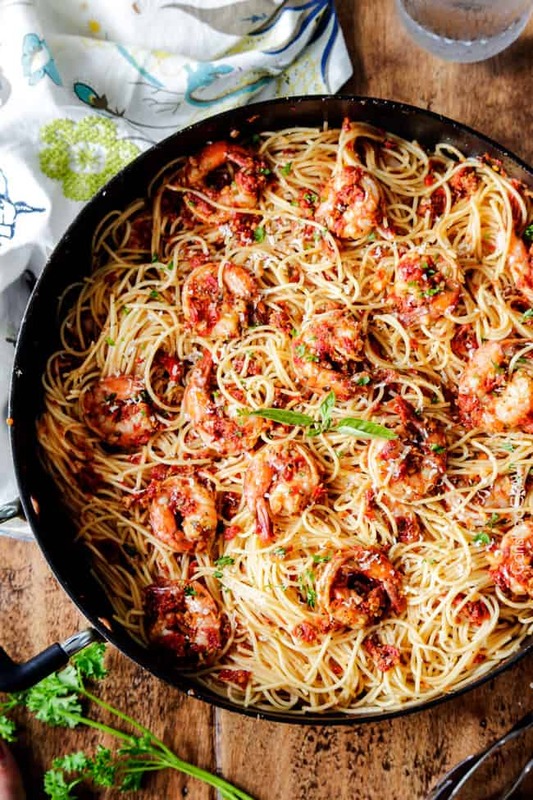 WHAT SHRIMP is best for this Shrimp Pesto Pasta? You can purchase shrimp that is larger or smaller. If it’s smaller, you want to sauté your pesto for a minute before adding the shrimp to give the aromatics more time tot cook. I usually purchase frozen shrimp so can keep it stocked at all times to make easy recipes like this Shrimp Pesto Pasta. I purchase shrimp that is shelled and deveined so all that’s left to do is defrost. I use almonds in my pesto because I love a good almond pesto and I always have them on hand but you are welcome to substitute them with pine nuts if you prefer. The pesto is further enhanced by tomato paste and balsamic vinegar for a sweet and tangy earthy flavor that is crazy delicious. How do I make Pesto? I know you might be tempted to purchase pesto to make Shrimp Pesto Pasta, and that is totally fine – it will just be a different recipe. 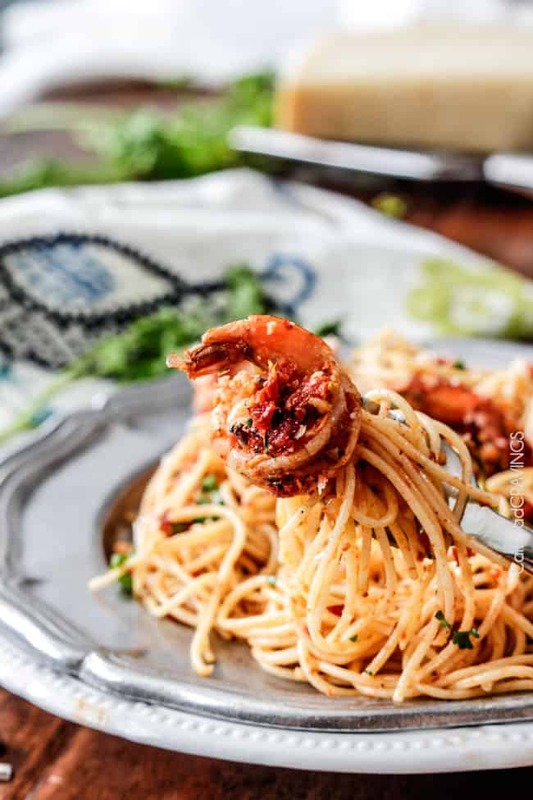 For this Shrimp Pesto Pasta recipe, you want THIS sun-dried tomato pesto – AND it is super easy to make! To make pesto, add all of the pesto ingredients to a food processor and process until finely chopped. What should my pesto consistency be like? You want your pesto to be thick, creamy and smooth. What if my pesto is too thick? Add olive oil one tablespoon at a time to loosen the pesto. You can also thin it with reserved pasta water once its added to the pasta. And you have the most dynamite, restaurant-worthy (I dare to say better than restaurant worthy) pasta in under 20 minutes! Color: Raw shrimp starts off translucent gray and turns pink and opaque when it is cooked. Your shrimp is done as soon as it is fully opaque without any gray left. The best place to check your shrimp for doneness is the crevice in the back of the shrimp where the vein was removed. When the base of this crevice becomes opaque, the shrimp is done. Can I add Vegetables to Shrimp Pesto Pasta? What can I use as a garnish? 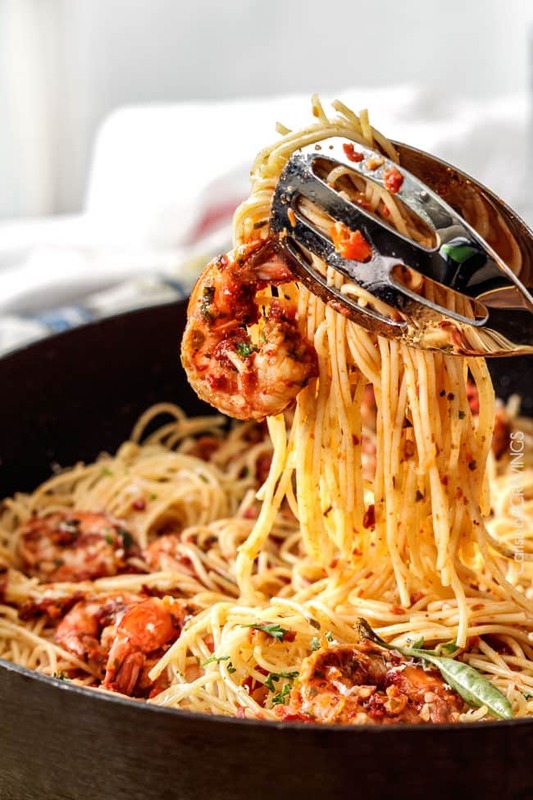 What can I serve with my pasta and shrimp? How do I reheat Shrimp Pesto Pasta? Microwave: Add a splash of chicken broth or water to your individual serving of Shrimp Pesto Pasta. You don’t need to stir it in yet. 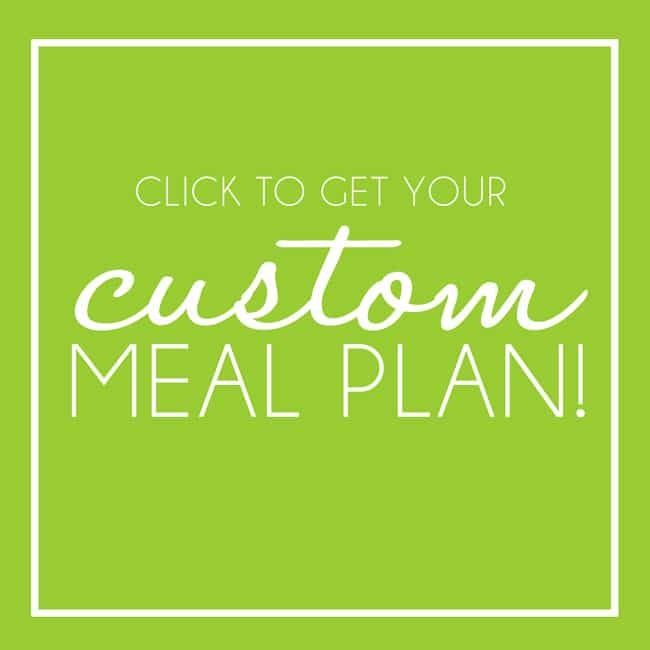 Microwave for one minute, stir, then continue to heat at 30 second intervals until warmed through. Stove: For larger portions, reheat Shrimp Pesto Pasta on the stove. You will need to add a splash of chicken broth or water to loosen the pesto. HOW LONG IS SHRIMP PESTO PASTA GOOD FOR? Shrimp Pesto Pasta should be stored in an airtight container in the refrigerator. When properly stored, shrimp pasta is good for three days. CAN I PREPARE SHRIMP PESTO PASTA AHEAD OF TIME? To make your Shrimp Pesto pasta come together even more quickly, you can make your pesto up to 5 days in advance and store it an airtight container in the refrigerator. The pesto will solidify a little in the refrigerator but will loosen once you heat it the skillet. You can also prepare your pasta in advance. Take care you cook it al dente, rinse in cold water and toss in a drizzle of olive oil to keep it from sticking together. Store in an airtight container. Cook the pasta in salted water. Once al dente, drain, reserving 1 cup of the pasta cooking water. 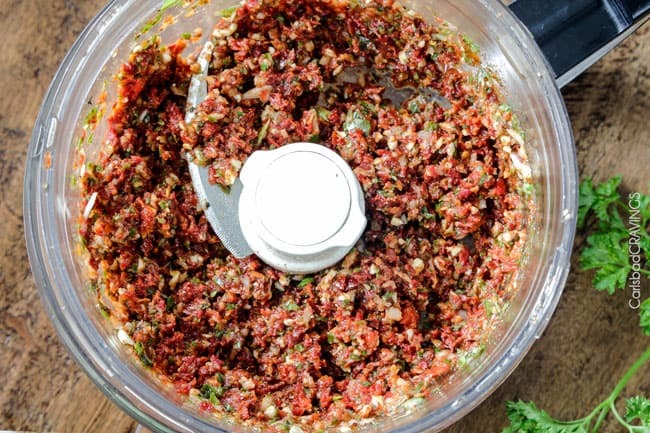 Meanwhile, add Sun-Dried Tomato Basil Pesto ingredients to a food processor and process until finely chopped. Heat a large nonstick skillet over medium high heat. Once hot, add Sun-Dried Tomato Basil Pesto and saute for 1 minute. Add shrimp and continue to saute just until shrimp are opaque. Stir in Parmesan cheese until mostly melted, then add pasta and toss to coat, adding enough reserved pasta water to moisten to desired consistency (I used 3/4 cup). Hi Dorothy, I am so sorry you are having back problems, I hope you feel better quickly! I am happy to hear though that your husband is taking good care of you – very good care of you with this pasta no less :)! I hope you both enjoy it!! This is drop dead gorgeous Jen!!!! Can’t wait to give it a try; just beautiful! Thank you so much Becky, you are too kind! I hope you love it – its a good one :)! Hi Jen!! 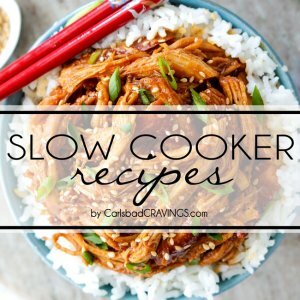 I found your site a while ago, and I have been enjoying your recipes!! 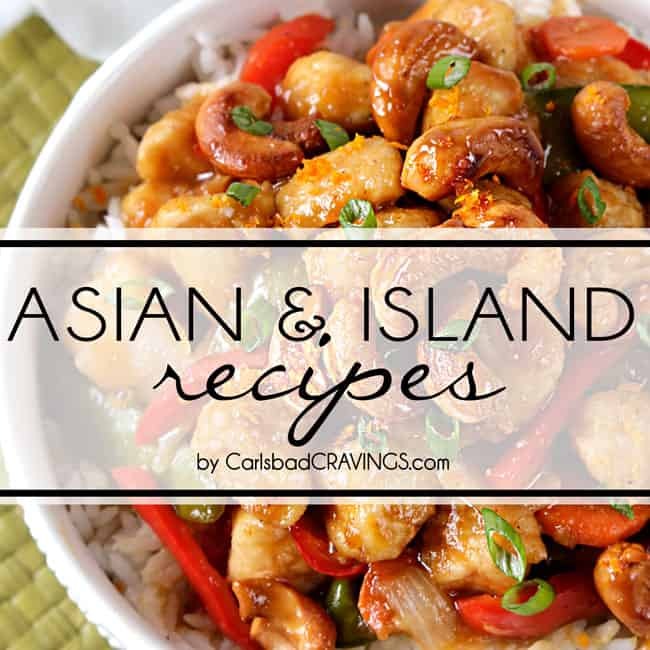 I meant to contact you earlier, but I always ended up with looking at your various great recipes and printing them out(there are a lot of them that I haven’t made, but I want to make), and getting late and tired, so anyway, here I am! 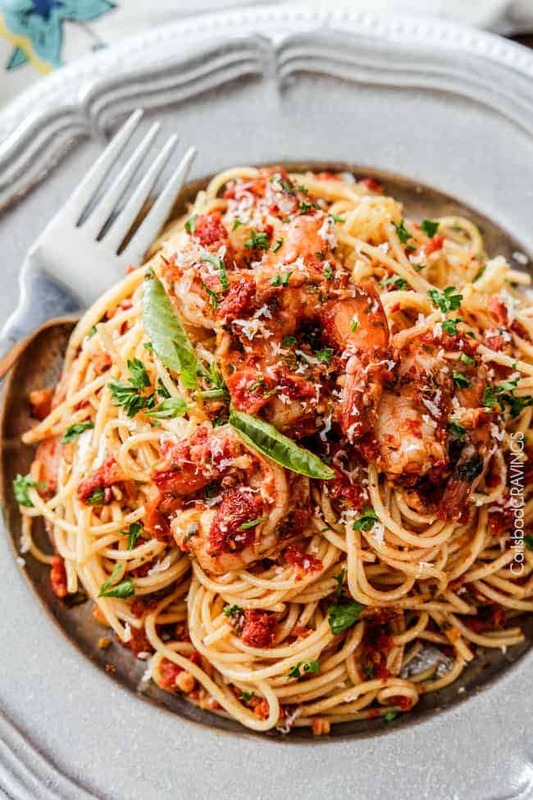 I made “20 Minute Sun-Dried Tomato Basil Shrimp Pasta,” and it was sooooo good. 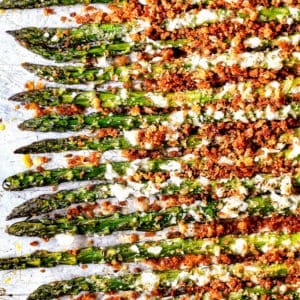 I think I am going to buy more sun-dried tomato just for this recipe! I also made your caramel, and really like it. James really like it, too! Oh, your garlic Parmesan stick was so good, too. I served it to sister missionaries, and they really like it, too! Yummy! I am strengthen by your faith and testimony. Thank you for being such a great example. You are amazing! You really are. We would love to see you sometime. I would love to catch up with you! P.S. I remember going to Thai food and playing wolleyball with you. Fun memories! Please say hello to Patrick! Oh my goodness Keiko, it is SO good to hear from you! Are you guys in San Diego? We definitely need to get together! 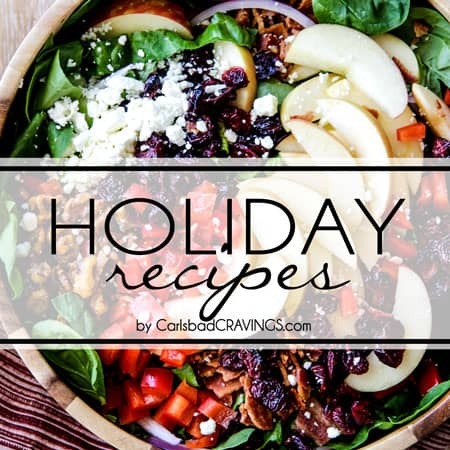 I am so happy to hear you have been following my blog and enjoying my recipes – that is the highest compliment! and I am SO happy you loved this pasta so much much – yay! I would love to catch up but couldn’t find you on FB. Want to PM me and we can go out to lunch? I would love to see you, thanks for reaching out! Hi Jen! It is so nice to hear from you, too! I don’t have FB account, but I just sent you a message. Please let me know when you get it. 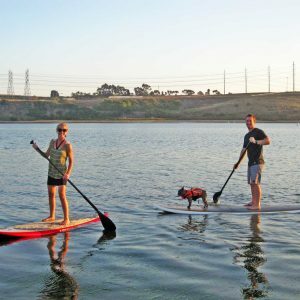 We live in 4 hours north from San Diego, but we visit San Diego often. Yes!! I would love to get together when we go there next time. By the way, I made “Easy garlic Parmesan breadstick” again tonight, and everyone loved it! Thank you for the yummy recipe! If I’m feeling a bit lazy and decide to use pesto from a jar, how much does this recipe call for please? Hi Vanessa! I’m sorry but I have not measured it out because I make the pesto with the sundried tomatoes. Sorry I can’t be of more help! Thank you so much for this yummy recipe! My whole family including my most fussy little eater love it! 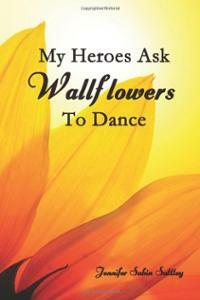 One question hope you can help. Can the pesto be kept in the fridge for about a week? I’m a working mum and it will definitely help if I could prepare this in the morning with the ready made pesto Keep up the great work Jen! 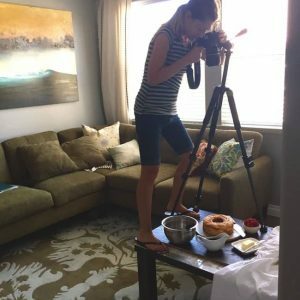 Oh, will you be doing video tutorials? Just found this recipe on Pinterest and I would love to make it for Valentine’s Day! 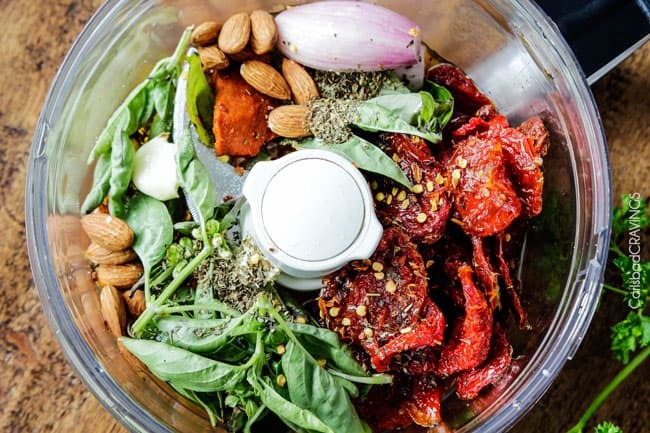 Just one question, do you add all of the oil from the sun dried tomatoes jar into the food processor with the tomatoes? Hi Raquel! 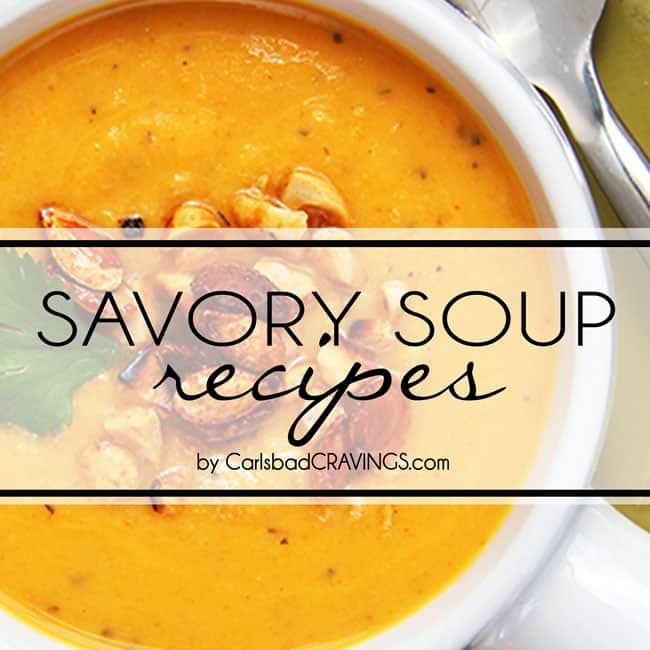 I am so happy you found this recipe and my site! Yes, you add all the oil in the jar – usually pesto has quite a bit of oil so this takes its place. Enjoy and Happy Early Valentines! I pinned this recipe about 2 weeks ago because your pics were so beautiful and the recipe was simple. Finally got around to making it today and it was amazing. I didn’t have enough basil so I substituted a basil parsley mix. I also forgot to add tomato paste, but it was amazing anyway. Also added mushrooms. Will absolutely positively do this again. Thank you for this!! You are so welcome Shelley, I LOVE hearing how much you loved this pasta especially because it is one of my favorites! I’m so happy you were able to make it and thank you for commenting! Have a beautiful Sunday! Made the pesto yesterday because my basil was starting to shrivel. Probably won’t make the dish until Friday. Would you suggest freezing it? This will be the third time I’ve made this and it’s outstandingly delicious! Hi Kelly! Homemade pesto should keep for up to one week in the fridge in an airtight container so you should be just fine without freezing it. Hope that helps! and I LOVE hearing this is the third time you’ve made this – yay! Hi I was wondering what is the break down per serving?? Thank you!! Thank you so so much Amanda! 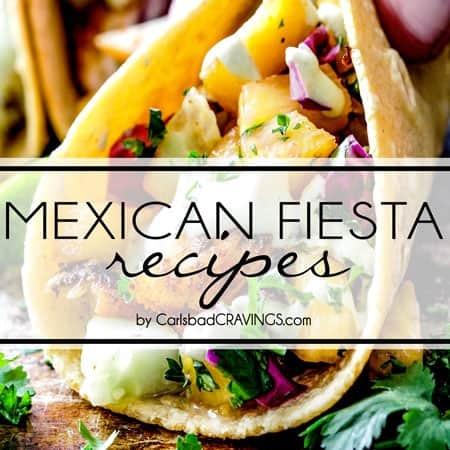 I LOVE hearing you are enjoying my recipes! and you have great taste, this is one of my all time favs! 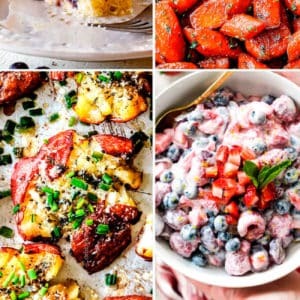 Have fun eating your way through my recipes :)! You are SO welcome Michelle! 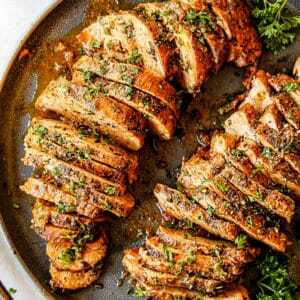 I am thrilled you found it equally delicious and easy! Today I am actually sharing a Greek pasta salad based on this recipe because I love it so much. Thanks for sharing on FB! This is delicious. Everything you said about it is true. I will be making this again! Awesome Doreen, I’m thrilled you loved it as much as me! Thank you!! 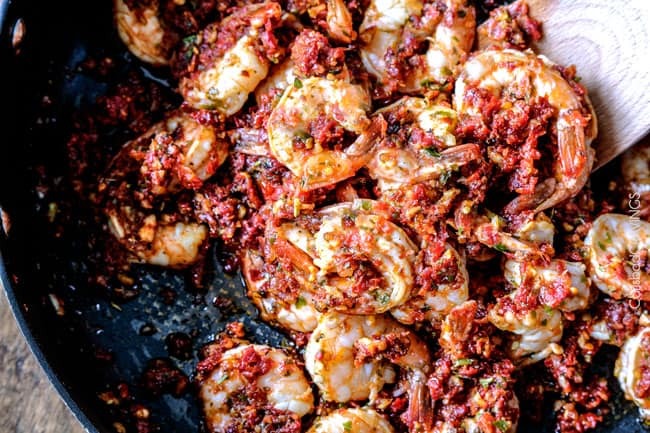 I am getting ready to make this – how much tomato paste and balsamic vinegar do you put in? It’s not listed on the ingredients. NEVERMIND my first question – I must be blind! It is there!!! Thanks. It’s listed in the ingredients as 1 tablespoon balsamic vinegar and 1 tablespoon tomato paste – enjoy! Hi Jen! We thoroughly enjoyed this sun dried tomato with basil and shrimp pasta last evening. It came together in absolutely no time and I was able to use a bunch of our garden basil when I doubled the pesto part of the recipe for future use. And thank you for doing the calculating for me…my husband had a friend over so there were only 3 of us. Sometimes after a 12 hour shift, I don’t like to use my brain any longer if you know what I mean! 🙂 Love your site! Thanks again. Awesome Cindy, I’m thrilled you loved it and your garden basil sounds divine! I definitely know what you mean – my brain certainly shuts down – I won’t let myself write recipes after a certain point! Thanks for taking a time to comment, I’m so happy you are loving my site!